Mankind has been using bows and arrows to hunt ever since the primitive times. Being some of the first ranged weapons that were actually quite efficient, bows and arrows saw a heavy use throughout the most part of our history. Since we’ve had to rely upon their effectiveness and power, we’ve learned to advance the art of bowmanship and the tools of the trade. But like all eras, the age of archery had to come to an end as well. With the dawn of firearms, the use of bows and arrows began to decline. But toxophilites from all corners of the world were never willing to give up on this fine skill. They held onto the traditions and managed to turn archery into a form of sports. Today, archery sees more use as a form of recreation than for military purposes. Modern archers practice archery for sports, the Olympics, bowhunting for recreation or just for backyard shooting for fun. But when a modern toxophilite starts his journey, he has to face some difficulties, from choosing the right bow and arrow to facing aiming issues. One such aiming issue is known as the Archer’s Paradox. 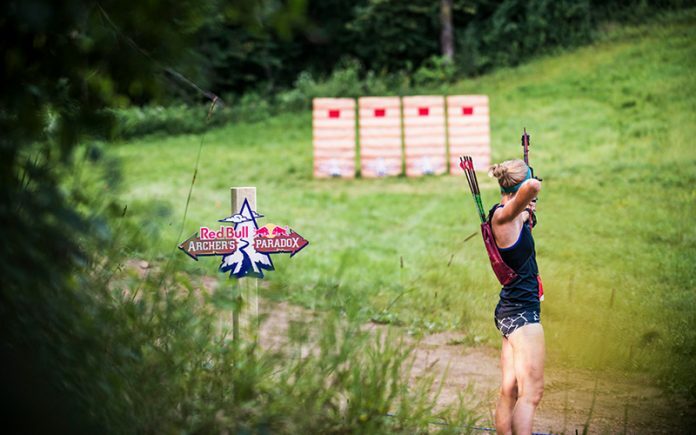 If you’re into archery or just trying to learn more about it, the chances are that you’ve heard that word many times over by now. But what is the Archer’s Paradox? Let’s talk about what it is and look at some of the ways to avoid it. Before learning how to shoot a bow, one must learn how to aim a recurve bow and avoid the archer’s paradox. But to understand the archer’s paradox first, one must understand how a bow and arrow works. First off, the arrow is placed on one side of the bow stave while nocking the arrow’s other end onto the string. Once knocked, if you try to aim the arrow down the sight in the correct way, you’ll notice that the arrow is sitting against the bow staff, aiming at an angle rather than at the direction the bow’s backside is facing. This happens because the bowstring is parallel to the bowstave. But when the arrow is resting onto the stave’s side and connected to the bowstring’s nocking point, it sets the arrow up at an angle. That sets up the archer for the paradox. When the string is being drawn further and further, the arrow’s angle keeps changing more and more. That’s when the archer is left facing a paradox: Will the arrow hit the target where it’s facing now? Or will it hit the target at the angle it has been facing all these times? With this paradox, the aim becomes far more difficult and unpredictable. This is what the archers Paradox is and now you know why it happens. So, what really would happen if you let go? Which angle will the arrowhead go towards and what trajectory will it follow? In this section, we’ll take a look at the effects of the archers paradox and how it affects the trajectory of the arrow. When the arrow is released, the bowstring springs back to its original position. If we try to imagine the scenario in a slow motion, we would visualize the bowstring retracting back to its original position gradually. As it does, the arrow keeps moving slowly back into its original angle before being launched off towards its target. But when it does, the arrow moves in an inward direction (towards the bow stave) due to the inertia from the shot. This is because the arrow had been in a lower angle when the bow had been fully drawn and as soon as the string snaps back into its place, the arrow has a tendency to go back to that “lower angle.” This gives it the required inertia to move towards the bow stave once it’s launched. It’s at this point that the flexibility of the arrow shaft comes into play. The flexible body of the arrow’s shaft, also known as the spine, makes the arrow wobble, acting against the forces of inertia (following Newton’s third law). However, with the heavier arrowhead and the fletchings balancing out the arrow’s flight, the arrow does not deviate from its trajectory. This balances the projectile during its mid-air flight, projecting it in a straighter trajectory. Even so, this issue can affect the aim of the archer in certain ways depending on the spine of the arrow, the fletching material, their types, and some other factors. For example, a stiffer arrow would balance out less, which might be good for bows with narrower staves. Apart from these issues with the mechanics, this paradox also breeds a margin of human error. For beginner archers, this paradox is going to give them a hard time deciding which angle might be correct to aim the arrow at. How to Avoid the Archers Paradox? Don’t fret or fear. The archer’s paradox isn’t as big of a deal for an archer as it seems. It’s true that when you’re changing to a different bow and/or arrow, this issue might create some minor inconveniences to the experienced archers. Let’s look at some of the ways we can eliminate the effects of this paradox. The first step would be to choose the right spine of the arrow. The spine of the arrow is one of the key players in eliminating the archers paradox. Choose the correct arrow spine and you’ll be home-free – your arrows will fly at the same angle, every time. The second best thing to do is just do a few practice shots. Remember the angle before the draw and the angle after to give your muscle memory an idea of where the arrow will hit when you’re letting go. Within a few shots, an experienced archer would be able to get used to the angle and not fall for the paradox again. The easiest solution would be to use a compound or a recurve bow with a modern design with the arrow rest being at a straight path, eliminating the paradox altogether. Soon, as you get more experienced with archery, you will get used to the paradox and these problems will cease to exist. Archery, in some aspects, is even more difficult and complicated than using firearms. Ranging from the types of bows, draw weights and lengths, an archer will be facing problems with anchor points, wind velocity, arrow spine rating, arrow’s grain weight, etc. – all adding up to the unpredictability of the trajectory. Above that, if something like the archer’s paradox is added, things would get a bit annoying real quick. But passionate toxophilites have patience and overcome these difficulties with their experience, knowledge, and dedication. So, reading this article and having the know-how of this is only a small step in a grander scheme. The best way to deal with all of this is to go out there and shoot some arrows with your recurve or compound bow and get the hang of it before traversing the path of mastery. So, good luck with your journey towards becoming a master archer. Have a great shooting experience and don’t let this paradox hold you back. Previous articleHow to Clean & Detail Your Car with a Pressure Washer & Foam Cannon?